Most economists pay little or no attention to nominal GDP when they think (and talk) about the business cycle, but if they had to explain how nominal GDP is determined they would likely mostly talk about NGDP as a quasi-residual. First real GDP is determined – by both supply and demand side factors – and then inflation is simply added to get to NGDP. Market Monetarists on the other hand would think of nominal GDP determining real GDP. In fact if you read Scott Sumner’s excellent blog The Money Illusion – the father of all Market Monetarist blogs – you are often left with the impression that the causality always runs from NGDP to RGDP. I don’t think Scott thinks so, but that is nonetheless the impression you might get from reading his blog. Old-school monetarists like Milton Friedman were basically saying the same thing – or rather that the causality was running from the money supply to nominal spending to prices and real GDP. In my view the truth is that there is no “natural” causality from RGDP to NGDP or the other way around. I will instead here argue that the macroeconomic causality is fully dependent about the central bank’s monetary policy rules and the credibility of and expectations to this rule. In essenssens this also means that there is no given or fixed causality from money to prices and this also explains the apparent instability between the lags and leads of monetary policy. From RGDP to NGDP – the US economy in 2008-9? Some might argue that the question of causality and whilst what model of the economy, which is the right one is a simple empirical question. So lets look at an example – and let me then explain why it might not be all that simple. 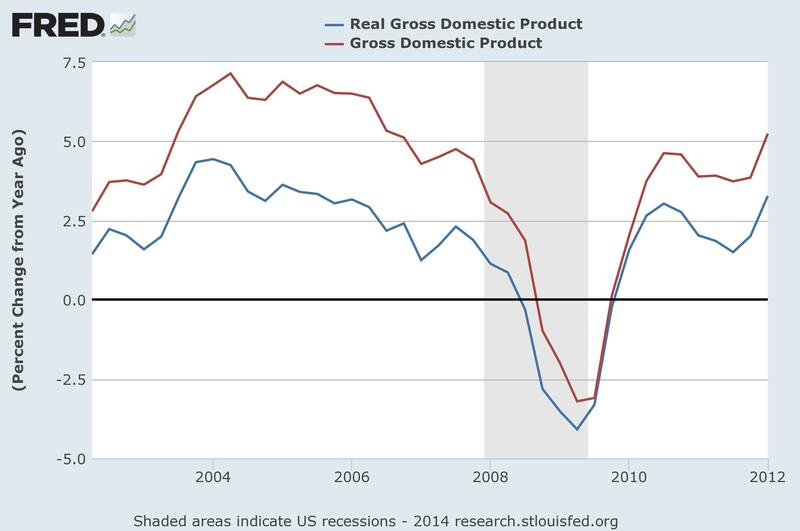 The graph below shows real GDP and nominal GDP growth in the US during the sharp economic downturn in 2008-9. The graph is not entirely clearly, but it certainly looks like real GDP growth is leading nominal GDP growth. Looking at the graph is looks as if RGDP growth starts to slow already in 2004 and further takes a downturn in 2006 before totally collapsing in 2008-9. The picture for NGDP growth is not much different, but if anything NGDP growth is lagging RGDP growth slightly. So looking at just at this graph it is hard to make that (market) monetarist argument that this crisis indeed was caused by a nominal shock. If anything it looks like a real shock caused first RGDP growth to drop and NGDP just followed suit. This is my view is not the correct story even though it looks like it. I will explain that now. So what was going on in 2006-9. I think the story really starts with a negative supply shock – a sharp rise in global commodity prices. Hence, from early 2007 to mid-2008 oil prices were more than doubled. That caused headline US inflation to rise strongly – with headline inflation (CPI) rising to 5.5% during the summer of 2008. The logic of inflation targeting – the Federal Reserve at that time (and still is) was at least an quasi-inflation targeting central bank – is that the central bank should move to tighten monetary condition when inflation increases. …Conditions in some financial markets had improved… the near-term outlook for inflation had deteriorated, and the risks that underlying inflation pressures could prove to be greater than anticipated appeared to have risen. Members commented that the continued strong increases in energy and other commodity prices would prompt a difficult adjustment process involving both lower growth and higher rates of inflation in the near term. Members were also concerned about the heightened potential in current circumstances for an upward drift in long-run inflation expectations.With increased upside risks to inflation and inflation expectations, members believed that the next change in the stance of policy could well be an increase in the funds rate; indeed, one member thought that policy should be firmed at this meeting. Hence, not only did some FOMC members (the majority?) believe monetary policy was easy, but they even wanted to move to tighten monetary policy in response to a negative supply shock. Hence, even though the official line from the Fed was that the increase in inflation was due to higher oil prices and should be ignored it was also clear that that there was no consensus on the FOMC about this. The Fed was of course not the only central bank in the world at that time to blur it’s signals about the monetary policy response to the increase in oil prices. Notably both the Swedish Riksbank and the ECB hiked their key policy interest rates during the summer of 2008 – clearly reacting to a negative supply shock. …the Executive Board of the Riksbank has decided to raise the repo rate to 4.75 per cent. The assessment is that the repo rate will remain at this level for the rest of the year… It is necessary to raise the repo rate now to prevent the increases in energy and food prices from spreading to other areas. The world is falling apart, but we will just add to the fire by hiking interest rates. It is incredible how anybody could have come to the conclusion that monetary tightening was what the Swedish economy needed at that time. Fans of Lars E. O. Svensson should note that he has Riksbank deputy governor at the time actually voted for that insane rate hike. Hence, it is very clear that both the Fed, the ECB and the Riksbank and a number of other central banks during the summer of 2008 actually became more hawkish and signaled possible rates (or actually did hike rates) in reaction to a negative supply shock. So while one can rightly argue that flexible inflation targeting in principle would mean that central banks should ignore supply shocks it is also very clear that this is not what actually what happened during the summer and the late-summer of 2008. So what we in fact have is that a negative shock is causing a negative demand shock. This makes it look like a drop in real GDP is causing a drop in nominal GDP. This is of course also what is happening, but it only happens because of the monetary policy regime. It is the monetary policy rule – where central banks implicitly or explicitly – tighten monetary policy in response to negative supply shocks that “creates” the RGDP-to-NGDP causality. A similar thing would have happened in a fixed exchange rate regime (Denmark is a very good illustration of that). I hope to have illustrated that what is causing the real shock to cause a nominal shock is really monetary policy (regime) failure rather than some naturally given economic mechanism. The case of Israel illustrates this quite well I think. Take a look at the graph below. 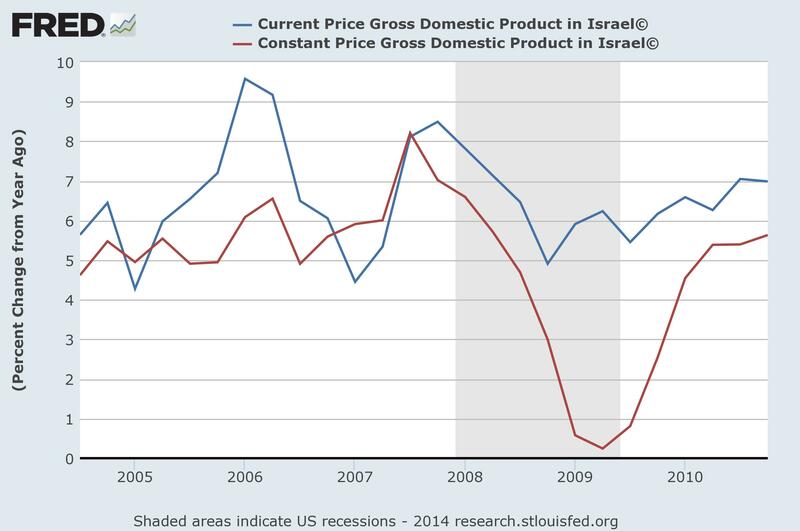 What is notable is that while Israeli real GDP growth initially slows very much in line with what happened in the euro zone and the US the decline in nominal GDP growth is much less steep than what was the case in the US or the euro zone. Hence, the Israeli economy was clearly hit by a negative supply shock (sharply higher oil prices and to a lesser extent also higher costs of capital due to global financial distress). This caused a fairly sharp deceleration real GDP growth, but as I have earlier shown the Bank of Israel under the leadership of then governor Stanley Fischer conducted monetary policy as if it was targeting nominal GDP rather than targeting inflation. Obviously the BoI couldn’t do anything about the negative effect on RGDP growth due to the negative supply shock, but a secondary deflationary process was avoid as NGDP growth was kept fairly stable and as a result real GDP growth swiftly picked up in 2009 as the supply shock eased off going into 2009. In regard to my overall point regarding the causality and correlation between RGDP and NGDP growth it is important here to note that NGDP targeting will not reverse the RGDP-NGDP causality, but rather decouple RGDP and NGDP growth from each other. Hence, under “perfect” NGDP targeting there will be no correlation between RGDP growth and NGDP growth. It will be as if we are in the long-run classical textbook case where the Phillips curve is vertical. Monetary policy will hence be “neutral” by design rather than because wages and prices are fully flexible (they are not). This is also why we under a NGDP targeting regime effectively will be in a Real-Business-Cycle world – all fluctuations in real GDP growth (and inflation) will be caused by supply shocks. This also leads us to the paradox – while Market Monetarists argue that monetary policy is highly potent under our prefered monetary policy rule (NGDP targeting) it would look like money is neutral also in the short-run. So while we under inflation targeting basically should expect causality to run from RGDP growth to NGDP growth we under NGDP targeting simply should expect that that would be no correlation between the two – supply shocks would causes fluctuations in RGDP growth, but NGDP growth would be kept stable by the NGDP targeting regime. However, is there also a case where causality runs from NGDP to RGDP? Yes there sure is – this is what I will call the Friedmanite case. Hence, during particularly the 1970s there was a huge debate between monetarists and keynesians about whether “money” was causing “prices” or the other way around. This is basically the same question I have been asking – is NGDP causing RGDP or the other way around. Milton Friedman and other monetarist at the time were arguing that swings in the money supply was causing swings in nominal spending and then swings in real GDP and inflation. In fact Friedman was very clear – higher money supply growth would first cause real GDP growth to pick and later inflation would pick-up. Market monetarists maintain Friedman’s basic position that monetary easing will cause an increase in real GDP growth in the short run. (M, V and NGDP => RGDP, P). However, we would even to a larger extent than Friedman stress that this relationship is not stable – not only is there “variable lags”, but expectations and polucy rules might even turn lags into leads. Or as Scott Sumner likes to stress “monetary policy works with long and variable LEADS”. It is undoubtedly correct that if we are in a situation where there is no clearly established monetary policy rule and the economic agent really are highly uncertain about what central bankers will do next (maybe surprisingly to some this has been the “norm” for central bankers as long as we have had central banks) then a monetary shock (lower money supply growth or a drop in money-velocity) will cause a contraction in nominal spending (NGDP), which will cause a drop in real GDP growth (assuming sticky prices). This causality was what monetarists in the 1960s, 1970s and 1980s were trying to prove empirically. In my view the monetarist won the empirical debate with the keynesians of the time, but it was certainly not a convincing victory and there was lot of empirical examples of what was called “revered causality” – prices and real GDP causing money (and NGDP). What Milton Friedman and other monetarists of the time was missing was the elephant in the room – the monetary policy regime. As I hopefully has illustrated in this blog post the causality between NGDP (money) and RGDP (and prices) is completely dependent on the monetary policy regime, which explain that the monetarists only had (at best) a narrow victory over the (old) keynesians. I think there are two reasons why monetarists in for example the 1970s were missing this point. First of all monetary policy for example in the US was highly discretionary and the Fed’s actions would often be hard to predict. So while monetarists where strong proponents of rules they simply had not thought (enough) about how such rules (also when highly imperfect) could change the monetary transmission mechanism and money-prices causality. Second, monetarists like Milton Friedman, Karl Brunner or David Laidler mostly were using models with adaptive expectations as rational expectations only really started to be fully incorporated in macroeconomic models in the 1980s and 1990s. This led them to completely miss the importance of for example central bank communication and pre-announcements. Something we today know is extremely important. Macroeconomists to this day unfortunately still forget or ignore the wisdom of David Laidler. Great post Lars. Although the past six years have been devastating, the root of the crisis is not as complex as many people (incl. many economists) are trying to make it. Thanks Jens…I might buy you lunch soon! Excellent blogging. I expect today Milton Friedman would be a Market Monetarist, although politics has so infected USA “economics” that if you want to know what an economist thinks about anything, ask him how he votes. I mean, Allan Meltzer told Japan to go to QE hard and heavy but says in the USA it will bring hyperinflation. For sure. Just keep waiting. The other odd aspect of QE that no one wants to talk about (except David Beckworth) is that perhaps the Fed should maintain its balance sheet in perpetuity. In essence, that will mean the Fed has monetized trillions in tax payer debt. So far, we are seeing no signs of inflation. Right—this is the cardinal sin of monetizing national debt by printing money. But what if it works, in measured doses? Vacuous. R-gDp and N-gDp are both products of money flows.